Although Paula is originally from Virginia and spent most of her formative years in Charleston, SC, she has lived in Upstate SC before. She earned her B.A. from Furman University and M.Ed. from Converse College. In 1994, she received her M.Div. from the Southern Baptist Theological Seminary in Louisville, KY. While in seminary, she completed a chaplaincy internship and discovered a deep passion for pastoral care and chaplain ministry. Following seminary, Paula served as a hospital chaplain in several locations in the Southeast. Her journey eventually led me to Boone, NC where she served as Director of Christian Education at St. Luke’s Episcopal Church. Through worship and formation experiences, she came to recognize how liturgy and ritual offer profound comfort, healing, and transformation particularly as they are experienced during life’s transitions. After a lengthy time of discernment, Paula began the process for ordination to the priesthood. 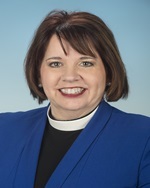 She completed a Certificate in Anglican Studies in 2015 from Virginia Theological Seminary and was ordained to the diaconate in 2015 and then to the priesthood in January 2016. Prior to coming to Spartanburg in August 2017, she served as the Curate at St. James Parish, Wilmington, NC. Paula and her husband, T., made their home in Mount Olive, NC. T. worked as the lead Chemistry Instructor at Wayne Community College in Goldsboro and retired in July 2017 after spending 34 years in the education field. They have two very spoiled toy poodles, Jack and Colby.